I have seen many comment threads in many forums devolve into statements of privilege and entitlement being flung about, often with little provocation¹. In some cases, there is history between the people commenting, and so there’s some, if often shaky, justification for these exchanges–however uncomfortable they make the innocent bystanders trying to have a rational discussion on difficult and/or uncomfortable topics. For their host, that is. Because they are just calling out racist, or homophobic, or misogynistic, or (fill in the blank) statements–which to be sure they often are. Because they are on the right side, the side of the good guys. When called on making such a leap, they are the ones offended and hurt–with said hurt coming across as more vitriol hurled out not only at the original ‘offender’ but also at anyone who dares point out that they have, in fact, crossed the line from pointing out a racist/misogynist/homophobic attitude into attacking a person. They call those who intervene “tone trolls” and claim that their speech is being stifled. And yet they refuse to see how an environment in which saying anything, no matter how bland or carefully couched, that disagrees with these few vociferous, vitriolic, acerbic and entitled commenters, chills conversation. Or perhaps they don’t care that, pretty soon, is only those few who are comfortable/able to cope with/thick-skinned enough not to give a damn about personal attacks on both sides–or indeed, trolling for the joy of derailing conversation–who participate in the thread. They refuse see their own privilege, even when it’s pointed out to them: that they have been allowed to run free for so long–and not only can’t tolerate limits imposed on their behaviour, on the host’s own space, mind you, but feel free to repay said host’s long suffering tolerance of their shenanigans by being abusive towards him/her. How dare the owner set limits and impose guidelines in his/her own space! After all this time! The cheek, I tell you. Perhaps whatever made the space so special to those leaving will leave with them–and perhaps that’s a good thing for those who remain, and for those who used to visit, and read, and comment, but who left precisely because such behaviour went unchecked for so long. Because another form of privilege is demanding that all others interested in the same issues as you be as thick skinned as you, comfortable using the same language as you, as capable of ignoring personal attacks and dehumanizing language directed at them, as you are. ¹ Please note that this does not excuse open racism/misogyny/homophobia/fill in the blank–I’m talking about relatively innocuous statements. Sometimes the people making those statements are not aware of their own bias/bigotry/privilege and not only don’t meant to be offensive, but may very well prove educable through conversation and debate. ² When a commenter only has to post once in a thread to have someone else immediately show up, not to comment on the topic at hand, but simply to call the first one a troll, before that person has even had a chance to make any sort of trollish/unacceptable/racist/homophobic/misogynist/fill in the blank statement. Never mind insulting the intelligence of every other reader/commenter who, apparently, need to be told who is to be trusted and who is not, because they lack the intelligence/maturity/savvy to discern it by themselves. And let’s not even mention insulting, in the same manner, the owner of the venue, who has every right to let that “troll” post until s/he decides…not to. It was amazing to read the giveaway thread because Ridley’s first comment was about the character being racist and privledged and then she immediately jumped anyone who had a differing point of view. But what killed me was in the comment thread about the moderation, she gave a reasoned explanation of her own learning about privledge. 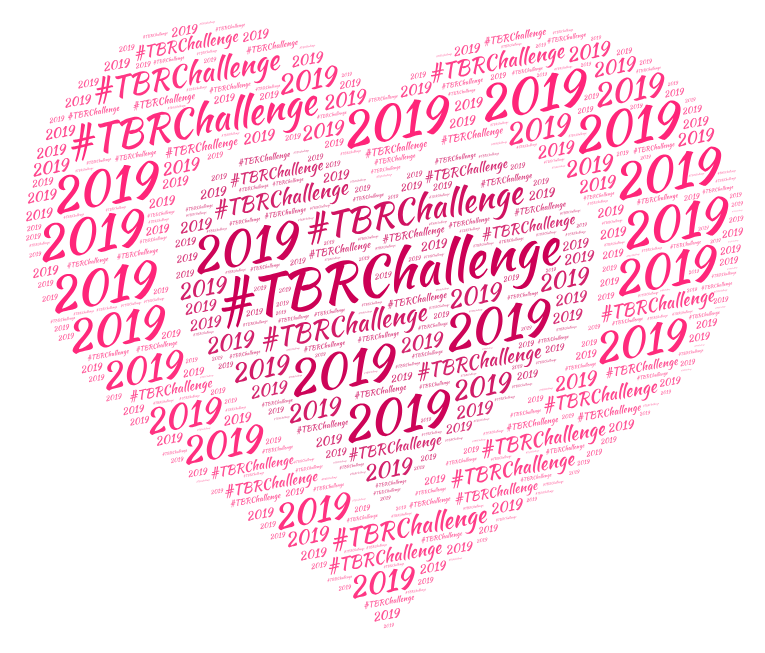 If she had posted that in the giveaway thread, had she explained herself and brought awareness to the table instead of vitriol, it would have been a robust discussion and a really positive environment. And I’m simply going to say that AS’s comment that she defended Jane when she got banned is so self serving as to be a stand up act. She said, at the time, that Jane disappointed her, had feet of clay and disparaged her quite roundly. Talk about rewriting history to fit your need. DA is my favorite blog ever. I love the reviews, the news and Jane herself. 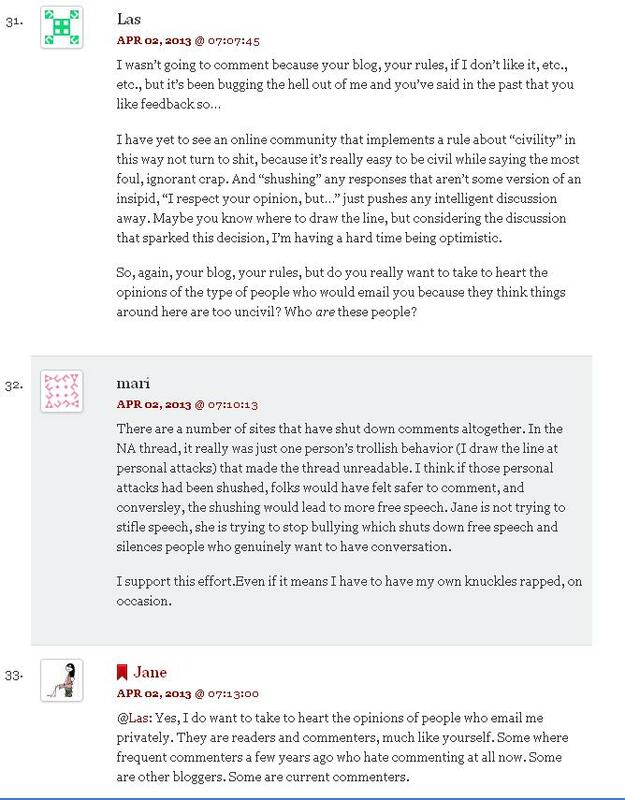 I don’t think Jane asking people to refrain from personal attacks stifles conversation. It fosters it. And if the complainers don’t like it, they can leave. Please. Go to their own blogs and say whatever they want. Actually I’m going to say something else. I reread the giveaway thread and have to say that I’m wrong. Ridley wasn’t OTT in that thread and although she pointed out privledge, she wasn’t her usual obnoxious self. She could have done it differently and added to the discussion but she wasn’t rude in that thread. I think the misfortune is that anybody who has seen the name calling previously is going to automatically attribute attitude and nastiness to the individual whether appropriate or not. Someone else took Ridley’s comments out of context and jumped, derailing that conversation. 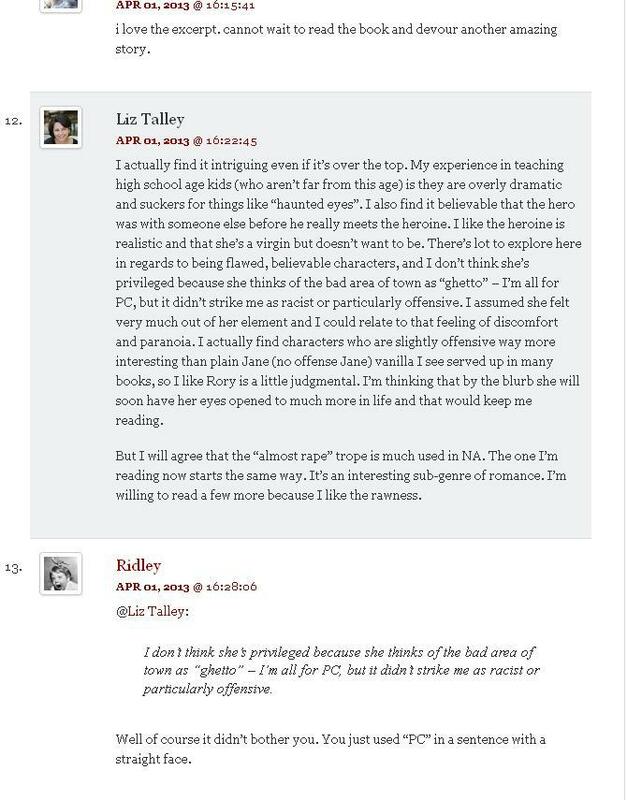 Regarding Ridley’s comments in the giveaway thread: while not as abusive as usual, she did jump to the conclusion that Liz Talley must have racial privilege–because Liz didn’t immediately agree with Ridley. That’s a rather big leap to make, frankly. 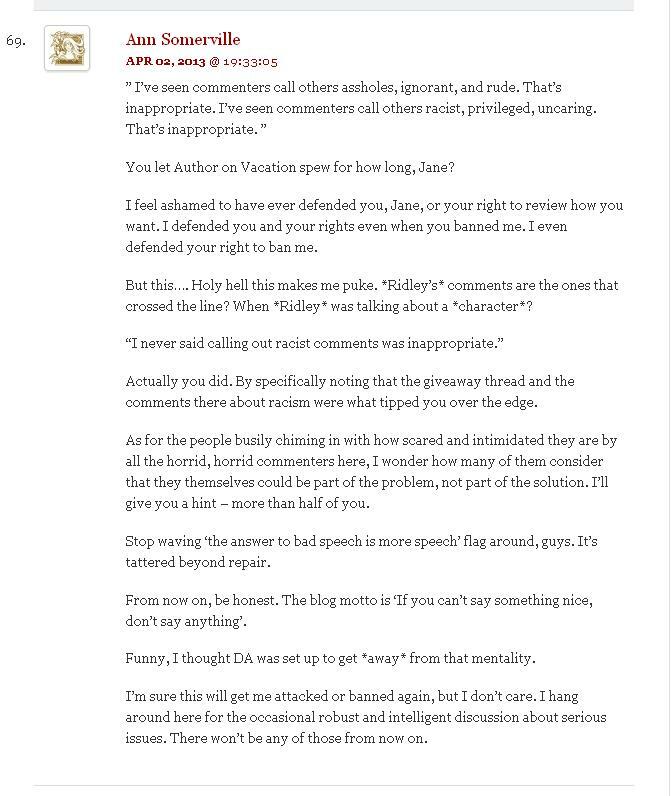 But further, the comment was “I don’t want to read a story narrated by a racist”–which is fair enough. 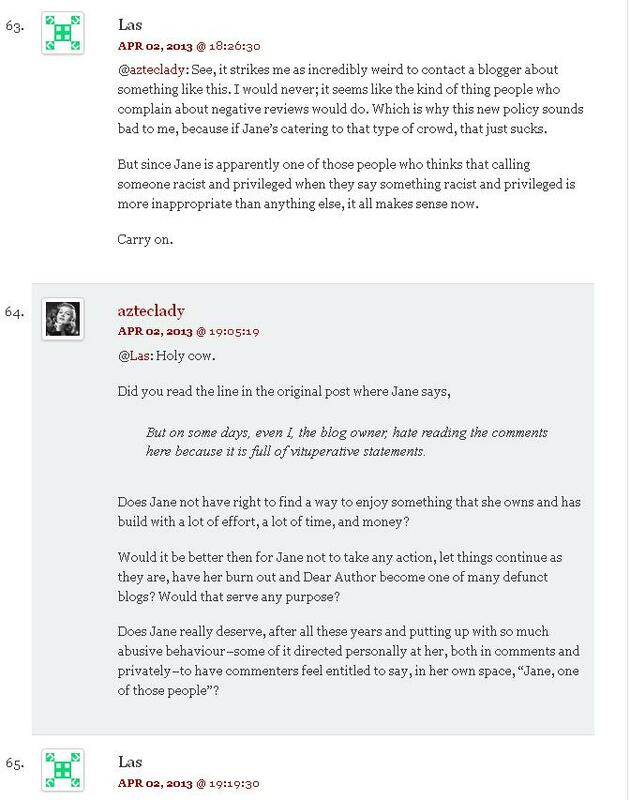 The comment I didn’t get a chance to make was, the character starts as a casual racist unaware of her own privilege–how do we know, a priori, that her growth into a person aware of her own privilege and therefore no longer prone to casual racism and discrimination, isn’t at least part of the point of the story? Most especially since this is a New Adult (coming of age, as it was once called) story? You know, pretty much like Ridley herself, as she explained in that comment you mentioned. Beyond that, I think Ridley has been digging her hole for a while–did you see the “I’ll be sure to keep you honest” comment in AJH’s guest introduction post? The guy has been invited by Jane to post and review at DA, and here comes Ridley to lay down the law. Who died and named her successor to the throne? AS: oh, I was there and I remember. 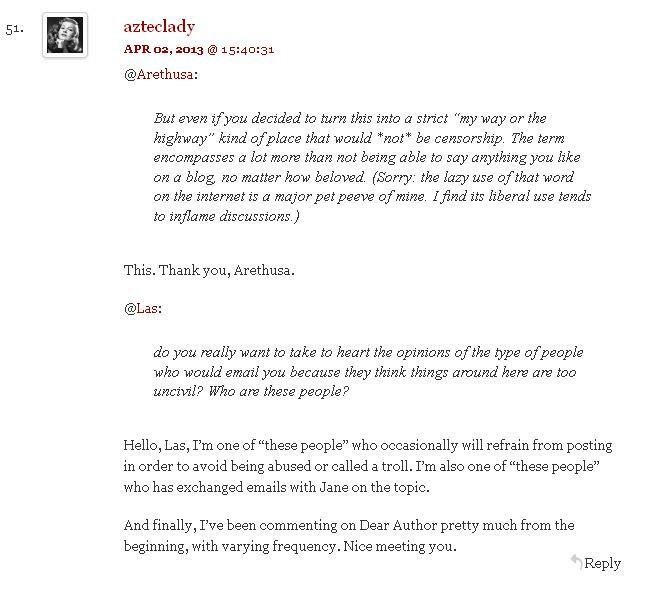 What irks me most is how often I agree with what I perceive to be the core of AS’s beliefs, but can’t participate in a conversation/thread where she posts without running afoul of her–mostly, because I take exception to her tone. 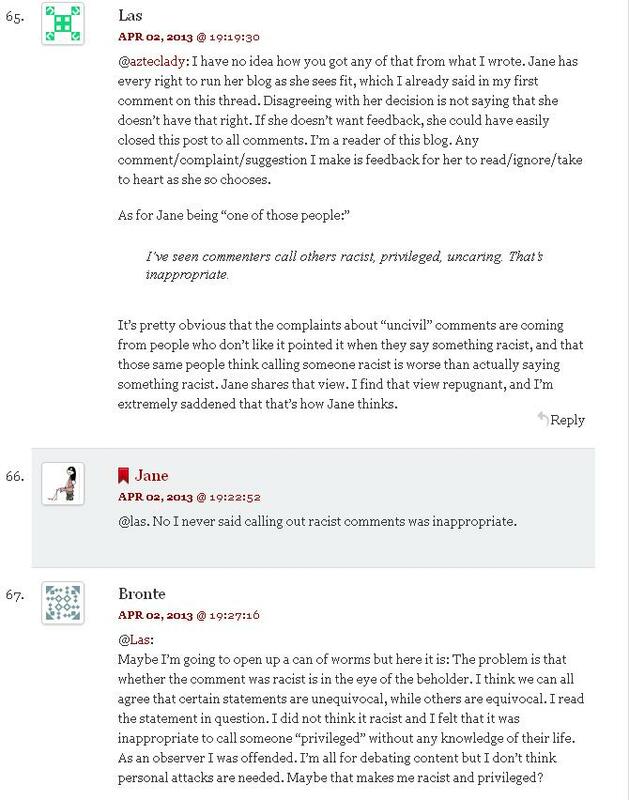 And finally, I think the community will be perfectly fine–those who are really offended by Jane’s decision to try and find a way to make her blog palatable to herself, may or may not take a hike, but those who care to make a bit of an effort to monitor how they phrase their opinions are more than likely going to find things to talk, disagree, and argue about passionately enough. As we’ve done for years. Oh you’re preaching to the choir here. I agree completely. I think that there’s also a huge difference between commenters who don’t believe in any view but their own (Author on Vacation) and those who are the same but abusive about it. I’m not thin skinned but I despise the way Ridley treats others and I do not comment sometimes because I just don’t want to run afoul of that.